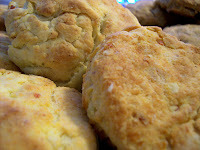 Buttermilk Biscuits, Bacon and... Raisins? | What Smells So Good? *Yawn*. Yes, I'm awake now, if I have to be! I was battling the elements yesterday (blowing snow and feeling like -12C) shuffling back and forth to my sister's school, her dermatologist and the bank, and after all that I was in the mood to make something comforting. Granted, I couldn't eat what I'd make, but for me the act of creating is more therapeutic than the eating of it! Taking my and bakery's famous (and my family's favourite) buttermilk biscuit recipe, I tweaked it this way and that until I had not one but two variations on the theme! I love cooking with buttermilk, the rich creaminess and subtle tang it brings to everything from the biscuits to bread and both chocolate and vanilla cakes is unlike any other ingredient out there, in my opinion! Add in the calcium boost and the fact that it's low-fat (despite it's rich name), and it's possible that a baking superfood is at your fingertips! So, this first recipe gets a double hit of tenderness to it, with the divine buttermilk teaming up with cornmeal and leftover mashed potatoes (which you know makes outstanding bread, if you follow these Daring Bakers). Add in some freshly grated, real Parmesan and some fake bacon bits (the recipe is actually vegetarian!) with a serious hit of garlic and yummm! 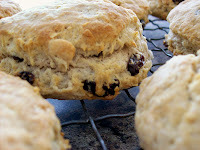 These are definitely great warm, but as with all biscuits you need to freeze them if you can't down em in a day or two! Combine potatoes, dry ingredients and cheese in a large bowl. Pour in buttermilk and mix just until blended. Do not overwork the dough! Pat out on a floured board, cut with a cookie cutter or rim of a glass and place on ungreased sheets. These second tasty treats are rich, sweet and buttery with a great flake. Perfectly spiced with a hint of cinnamon, the dough works perfectly with dark Thompson raisins and (if you like) even pecans (I left them out). Again, best warm out of the oven, but can be frozen and microwaved for a quick nibble. Cut in butter and shortening until a coarse-meal texture forms. Pour in buttermilk and mix just until blended, mix in raisins. Do not overwork the dough! Hello, I found your blog via facebook which I recently joined. Your Pierogi Puffs sound wonderful and I do intend to make them. This post caught my eye because my grandmother is Polish and I grew up eating Pirogie.